Sadia Afrin is a Bangladeshi actress and model who is best known around the country as an item song actress. She comes into the media world with a beauty pageant ‘Bichitra Photo Sundry’ in 2011. At present, she is one of the most discussed actresses in the country, cause she leaks a news about the producer who proposed her for sexual relation with him. Sadia Afrin was born on July 07, in Pirojpur, Bangladesh. Afrin was very much interested about acting from her early life and would to compete in various child art competition at childhood. Sadia dreamed of to be a doctor or an engineer at early childhood, but she could not get a chance at any government medical college during the admission test. Sadia has completed HSC from Pirojpur Government College then she admitted to the Government Bangla College and completed Masters in English from the college. Sadia Afrin made her debut in the big screen with a movie ‘Daring Lover’ where she performed as an item song actress, find a great response from critics and audience. She gets numerous offers for acting in the item song, but she would not like to continue as an item song actress wanted to be the main heroine. Already, she signed for various movies as a heroine like Dangsho Manob, Shod Protishod, and Moron Nesha. Sadia also acted in various Bengali dramas like Chitro Jogot, Nirobe Nivrite, Otopor Biye and Lal Banu. She played a terrific role in the drama Nirobe Nivrite. In the movie ‘Ochena Hridoy’s item song, Sadia Afrin showed her terrific performance and glamorous body figure for this she had to consume some criticism from the critics. 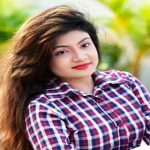 Sadia Afrin is the unmarried actress in the Dhallywood film industry. Recently, she accused against a film producer who proposed her to make an illicit relationship, but she refused the proposal, thereby the producer has been excluded her from the movie.